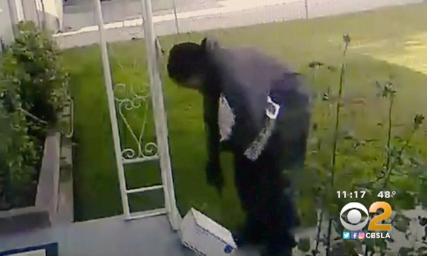 RIVERSIDE, Calif. — A porch thief got an unexpected surprise after swiping a package from a home in California. A victim of the growing problem of package theft in Riverside purposely put an item outside his door that isn’t in high demand, CBS Los Angeles reported. “At first I really felt violated even though I knew what was inside the package, I was still like, he stole from me!” Mike Zaremba said. Inside it, there was not one thing of value, just a bunch of poop. “Since we’ve lived at this house we’ve had three packages stolen, so just trying to get back at somebody,” Zaremba said. Zaremba’s clever idea came from his best friend. “Our Great Dane had her first birthday so my wife threw her a birthday party. We had 7-8 dogs here,” Zaremba said. As you can imagine, lots of land mines. So Zaremba gathered the piles of poop and put them in the box, sealed it up and left it on the front porch. Sure enough, the thief took the bait. Riverside police eventually tracked down the alleged thief Daniel Aldama. “He dropped it as soon as he found out. He didn’t want nothing to do with it and kept on riding,” Ronel Newton of the Riverside Police Department said. To find out how to keep your packages safe this holiday season, without taking this drastic measure, click here. As Washington continues to digest the Mueller report, some are pointing out the differences between what special counsel Robert Mueller wrote and what Attorney General William Barr said. Darren Samuelsohn, Politico senior White House reporter, joins CBSN's "Red and Blue" to discuss the differences.